See? 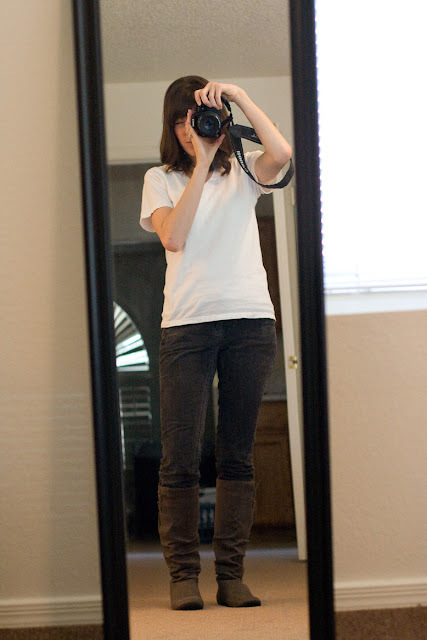 The boots? They totally make me look stumpy. Oh well. One of those lazy days. Sometimes this is just as good as it gets. Although, I DID wear an outfit composed of entirely non 30 for 30 items. Check it out. Once upon a time I was a runner. Before I got knocked up with Baby 2 I was training for a half marathon but thanks to Stinky's complicated pregnancy I had to scale my exercise way back when I got pregnant again. Unfortunately, running is one of those things where if you don't use it then you lose it really quickly. I tried to get back into the swing of things after Baby 2 was born and did pretty well for a couple months but that fell apart as my running partners got really busy and I had no one to run with at night after the babies went to bed. Then, a few days ago, I ordered this. I downloaded a couch to 5k podcast on to my phone (I'm totally back to square one. Blergh), strapped the babies in, and went running (well, walking/jogging) at 1 in the afternoon. The sun was shining, the birds were singing, the kids were mostly content. And it felt goooood. The best part, though, came at the very end of my run when I was getting a little sweaty and Stinky piped up from his comfy seat in the stroller, "Mommy! I tired." Haha, cool stroller/runner thingy. When I see moms with those their coolness goes up about 10 points. awww i hope you still get to run. 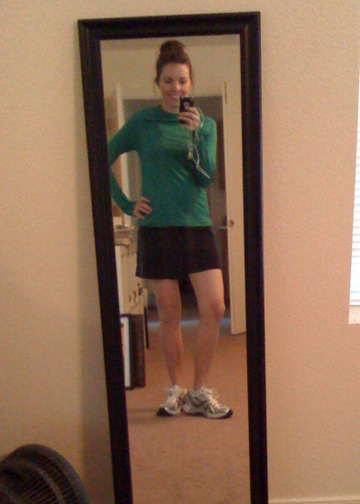 i took running for PE class in college and though i was really slow/bad at it, it made me feel really good. and no, your legs dont look stumpy in that outfit. what are you talking about! hope you get a run in this weekend. hi, fellow remixer here. Your story about going out for a run...and having the kid say he's tired is too good. I actually really like those boots. Then again, I rarely wear heels. They make me feel like a gigantic Amazon lady. running is what has kept me sane through motherhood! you are amazing if you can run with a stroller! and i love your running skirt. those are my fave.